The People United Will Never Be Defeated, Frederic Rzewski's landmark set of 36 variations on Sergio Ortega's Chilean protest song, enjoyed its 40th anniversary last year with a new recording by its first exponent and greatest champion, Ursula Oppens (Cedille 900000 158). 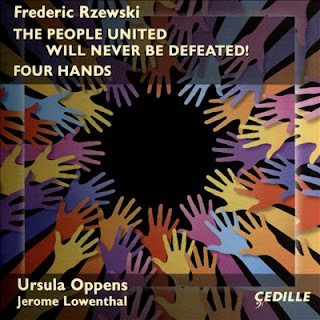 Included on the album is also the premiere recording of Rzewski's "Four Hands," featuring Oppens and Jerome Lowenthal. Rzewski's "People" was one of the 1970's most striking piano masterpieces. If nothing else, it was one of the bellwether works in the new multi-stylistic worlds that eventually would come to be thought of as "post-modernism." But it surely is much more than that. It put Frederic on the map in a big way and rightfully so, for it is incredible in its whirlwind kaleidoscope of variational inventions, an explosion of brilliant virtuoso pianism that takes us through endless modulations, permutations, changes in mood and direction that enthrall the listener from first to last. The variations run the gamut from a clangorous ultra-romanticism to the edge of modernity and back. Ursula Oppens' original recorded version in 1979 was an occasion. It was Grammy nominated for good reason, as it was an ideal expression in Oppens' hands. Other versions have followed, most all worthwhile on any number of levels, but Ms. Oppens' version has remained the benchmark by which the others were measured. The 40th anniversary performance-recording scales the heights triumphantly. If anything Ursula outdoes herself in a deeply expressive, tumultuous and tender reading that stands before us as the highest sort of achievement. Her performance is nothing short of breathtaking. The addition of the new, briefly succinct "Four Hands" is an added bonus portrait of the composer today, with four compact movements that show wit and expressive complexity. When heard in sequence they form a nicely flowing coda to the variations. Couple all this with state-of-the-art modern recorded sublimity and you have an irresistible offering. Whether you have the Rzewski variations or not this album literally glows with pianistic brilliance. If you want to get a handle on Rzewski and '70s new modernism this is an album to have, surely. Kudos!